Virtopsy is actively involved also in teaching and training. You will be learning directly from the pioneers – those that started with wide-scale forensic post mortem scanning in 1999. 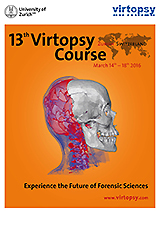 The Virtopsy Courses are offered as a CAS (Certificate of Advanced Studies) in Forensic Imaging & Virtopsy. The certificate is obtained after completing all assessments and course modules. The modules can be taken separately. The Basic course (module I) consists of two days with a focus on post mortem CT (PMCT). Lectures are followed by workshop sessions where participants will learn how to solve case related problems in context of the preceding lecture on a CT workstation. So a lecture about drowning will be followed by a hands-on session with cases where drowning was an issue. The Advanced course (module II) will make the imaging (PMCT, post mortem MRI) of a concise case that is followed by a full forensic autopsy available to course participants. There will also be a similar case demonstrated in full examination for PMCTA (post mortem CT angiography). Also, the Advanced course expands the subjects of the Basic course with more detail. The Practical course then teaches how to read PMCT more systematically, how to provide convincing written and image documentation for forensic use, it teaches practically how to perform PMCTA and also, how to perform 3D photogrammetry for surface documentation. 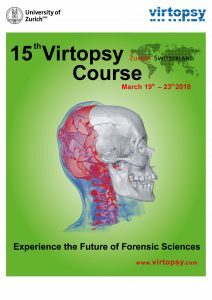 Virtopsy Courses provide theoretical and practical knowledge of forensic imaging, notably post-mortem CT and MR, forensic anthropoloy, post-mortem angiography, surface scanning and 3D-photogrammetry, robot-guided biopsy, and clinical forensic imaging. There is a Basic Course (2 days) and, immediately following, the Advanced Course (3 days) and a Practical Course (3,5 days, optionally up to 5 days). A new 1-day Pre-Course has been defined to teach 3D viewing software to people that request this. A new Virtopsy PRE-Course (DICOM image manipulation and reading) is offered on the Friday preceding the regular Virtopsy Course modules. It teaches use of CT reading software including syngo.via (which is the system we have here for routine work and research, and that we also use for all three regular Virtopsy Course modules) and a non-commercial DICOM reading software (3D slicer). It is available for registered participants of module 1 (and those that take modules 1 and 2, or 1-3) for a reduced price. Entry-level skills are taught to read post-mortem CT cases in both Basic and Advanced courses (modules 1 and 2). With that, modules 1 and 2 may be interesting for a wider audience, for students and people interesting to learn about the potential of the Virtopsy methods. 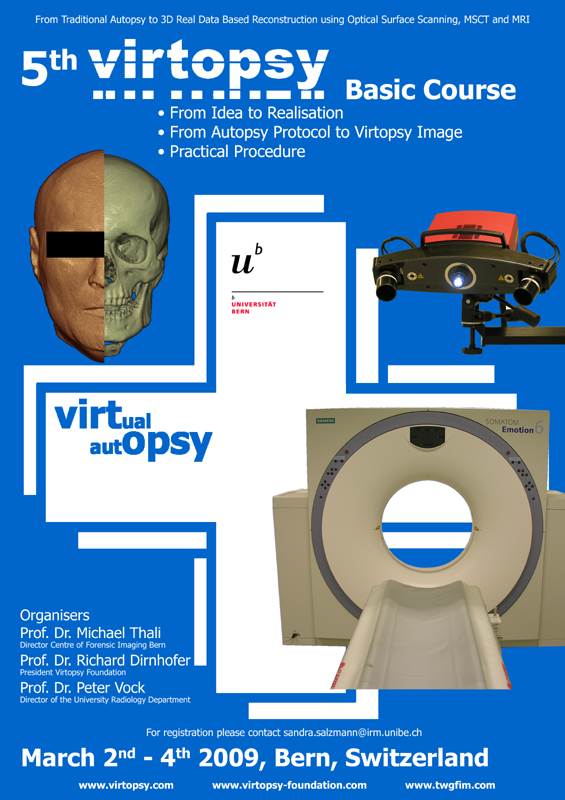 The Virtopsy Practical Course (module 3) is geared towards actual users of post-mortem CT scanning and teaches practical forensic CT reading and documentation, we also teach CT angiography using very affordable materials, and practical 3D surface photogrammetry using consumer cameras. The target audience for module 3 therefore will most likely be people that are responsible for actually reading cases and generating forensic imaging reports. Virtopsy PRE-course (DICOM manipulation and reading course). This is a full 1-day introduction into the technical aspects on how to use DICOM data manipulation and reading software for the benefit of applied forensic imaging. As that, it provides relevant practical teaching on how to use axial image viewing, windowing, MPR (multiplanar reconstruction), and VRT (3D volume rendering technique) both on our institute’s production system (Siemens syngo.via) and a non-commercial software (3D slicer). It is not a pre-requisite for the regular course modules but it can make life a lot easier for participants that are new to forensic CT image reading. Virtopsy Basic Course (CAS Forensic Imaging & Virtopsy module I – theory). The course attendants will receive a Certificate of Attendance once they provided full attendance of the lectures of this course. Maximally allowed participants are 20. A written assessment has to be passed. One ECTS point is awarded. We regularly apply for CME credits as well. Virtopsy Advanced Course (CAS Forensic Imaging & Virtopsy module II – theory) (module I is a requirement, this is only for those that did the Virtopsy Basic Course in the past). The course attendants will receive a Certificate of Attendance once they show previous attendance of module I, and once they provided full attendance of the lectures of this course. Maximally allowed participants are 20. A written assessment has to be passed. One ECTS point is awarded. We regularly apply for CME credits as well. Since 2017, there is a new course module that complete the steps towards the CAS certificate: (details see here). They constitute the modules required to attain a CAS in Forensic Imaging & Virtopsy. Virtopsy Practical Course (CAS Forensic Imaging & Virtopsy module III) (module I and II are a requirement, this is only for those that did the Virtopsy Basic and Advanced Courses in the past); in addition to attendance of the course, assignments and tests need to be passed. The course attendants will receive a Certificate of Attendance once they provided full attendance of the lectures of this course and passed attendance and assessments; prior attendance of the previous modules is a must. Maximally allowed participants are 12. Four ECTS point is awarded. We will apply this course for CME credits as well. The course is on-site here at the Zurich Institute of Forensic Medicine. CAS Forensic Imaging & Virtopsy Casebook (50 cases; included in module III): each participant has to prepare and submit a book containing 50 case descriptions. These then are asssessed by the Virtopsy team. The casebook is usually the last step in completing the studies necessary to obtain a CAS in Forensic Imaging & Virtopsy. This does not have to be completed on-site – usually, participants make their casebooks at home or where they usually work. The Virtopsy Courses (modules I and II) also contains a special focus on Forensic Anthropology, as this field has taken up forensic post mortem imaging across commingled remains, mummy research and mass disaster events. Particularly for forensic radiologists, this new area of examination and research is very relevant from our medicolegal viewpoint. We also include other new or relevant subject matter to present to the course participants as technology and research are evolving. The course also introduces new technologies such as 3D-printing, 3D-visualization and Deep Learning. We have research in these areas and feel it relevant to show how these link into post-mortem CT-imaging. The 3D surface documentation session is an addition that is regarded as particularly relevant because of a recent rise in surface documentation also in forensic science where crime scenes and scenes of traffic accidents are increasingly documented in full 3D. An introductory lecture is provided in module I, and a full day of practical instruction is performed as part of module 3. Post mortem CT angiography is now taught and practically expanded on the Virtopsy Practical course. Participants will also receive a full PMCTA kit (pump, power supply, materials, tubings, etc.) complimentary with the practical course. How to use the software is a clear non-issue for radiologists but it can be relevant for forensic pathologists to learn this aspect in more depth. Please sign up separately for the Virtopsy PRE-Course if you are interested. In a case of close range / contact head shot, gunshot residue (image: cyan, ring shaped in subcutaneous tissue), fracture pattern and intracranial findings (red: blood density range) can be examined for shape, extent and distribution. The following image shows Slicer 3D (below images: polygon segmentation, surface ready for STL-export for further applications such as rendering or 3D-printing) and syngo.via (Siemens) imagery (top three figures: VRT reconstructions after segmentation). The single steps involved in axial, MPR and also VRT viewing using syngo.via-Siemens software as well as steps in segmenting in Slicer 3D are taught in the facultative Virtopsy Pre-Course (module 0). We regularly apply for EACCME accreditation. Depending on the specific time schedule of the course, each course part (pre-course,1,2,3) is awarded a number of CME points. In 2019, the pre-course was awarded with 6 CME points, module I was granted 13 CME credits, module II was granted 19 CME credits and for module III, 28 CME points were granted. 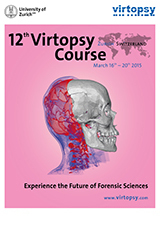 17th Virtopsy Course / 4th CAS Forensic Imaging & Virtopsy: March 16th to 26th, 2020. To maintain quality standards, we will not accept more than 20 registrants for each the basic and advanced modules of the course. Please note that your registration can be confirmed only upon receipt of payment.